Joseph McCullough, a trained painter, holds a diploma from the Cleveland Institute of Art. He has also received his BFA and MFA from the School of Art at Yale University, where he studied under Lewis York and Josef Albers. Throughout his life he has continued his study of art around the world with trips to art schools, academies, and universities in England, Scotland, Germany, Switzerland, Norway, Sweden, Denmark, Finland, Japan, and China. Very much involved with art education, McCullough is President Emeritus of the Cleveland Institute of Art, where he served as head for 34 years. At the Minneapolis College of Art and Design he was a member of the Board of Trustees and served on the Academic Affairs Committee. 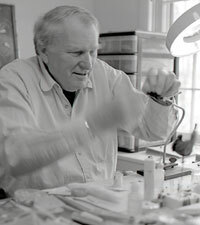 McCullough is also a past President, Fellow, and Life Member of the National Association of Schools of Art and Design. While McCullough is a practicing painter, in his personal life he also takes an interest in photography and is involved with a variety of outdoor activities including birding and fly-fishing.